I am taking a little break from applying essential oils topically, so I have to invest my essential oil obsession into diffusing. I have some concerns about my health right now, and while the essential oils do heal, and do many great things, I want to make sure that my oils aren't what is causing this issue. Since diffusing is what I am focusing on, I have experimenting with different blends, and reading up on the benefits of diffusing certain oils together, but my most favorite blend is for ridding the home of impurities, detoxifying the home, ridding the home of horrid smells, kicking out sickness, and boosting immunity. 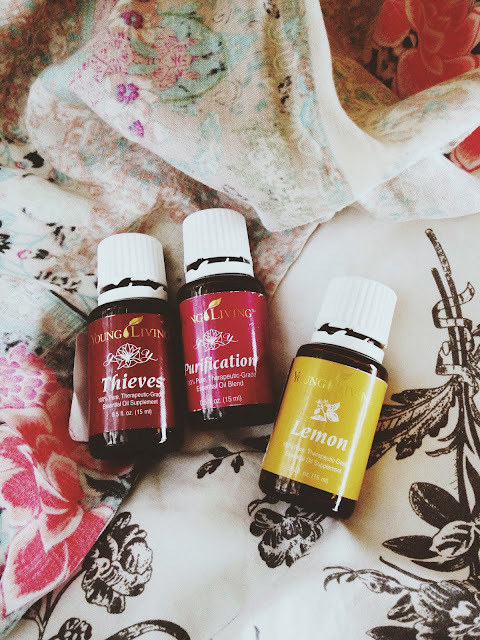 This diffuser blend is equal parts Thieves, Purification, and Lemon. I love immunity boosters since I work in a place where sickness could potentially be everywhere. I have avoided getting sick for months, and I do believe that it is because my oils are so versatile, and they actually protect. I have avoided the flu that has been going around my campus, and again, my oils protected my body against invaders. Thieves is an oil blend that I would rub on my feet before school, and before work. Since I am not applying my oils topically this week until I find out some answers, I am staying close by my diffuser to make sure I get that immunity boosted. Thieves is a cleansing, purifying blend, and it is the perfect flu bomb, but paired with Purification will enhance immunity boosting. 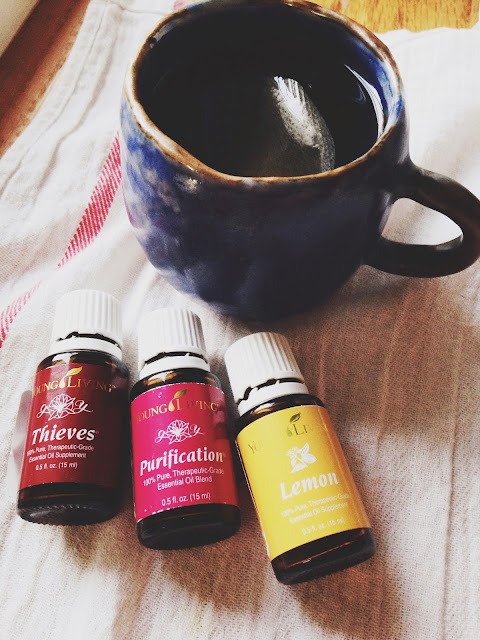 This blend will knock illness right out of you, and will kick those nasty germs out of your house. It smells fantastic, I turn my diffuser on, and in mere seconds, the house is filled oily goodness. 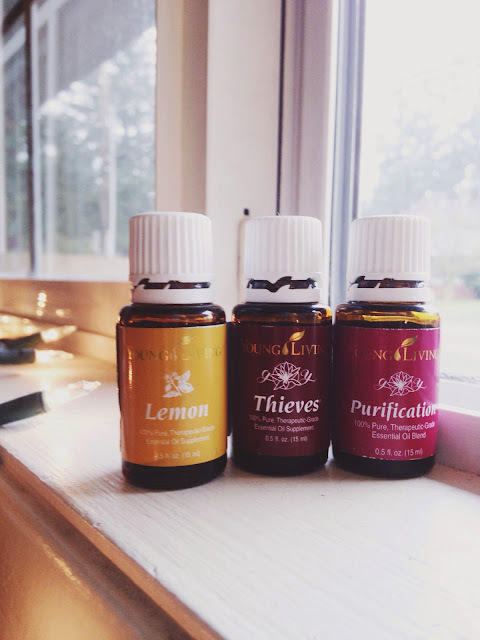 Since Thieves contains Lemon, I diffuse lemon right along with Thieves to make my Thieves bottle last longer, and to increase it's detoxification benefits. I read a little trick from one of the oily gurus in my oily community that if you add lemon with Thieves in the diffuser, you don't have to use so much. I love saving when I can, it is such a great tip. Drinking my citrus essential oils is included in the break. I'm not putting my citrus oils in my water until I get some answers. I would love to put some lemon in my green tea, but I will wait on that. There are no oils in the tea, but I wanted to show off my mug that I made. After this week, after I see the doctor, I will be putting a drop in my tea, in this beautiful, little mug; until then though, I am just diffusing lemon with Thieves and Purification. 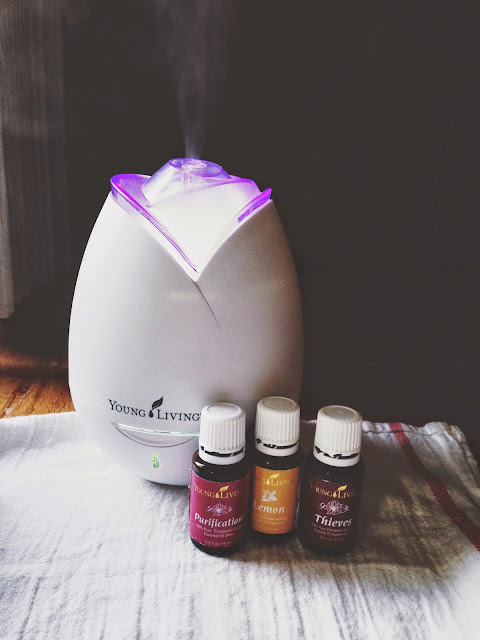 This blend of oils is perfect to diffuse when cleaning the house. I love setting up the diffuser in the kitchen, and I give the kitchen a deep clean, or any room that I want to spiff up; I turn my diffuser on, and it just feels cleaner. My house is not a messy house, but it is always good to go through your belongings, and get rid of things that aren't receiving a lot of attention. This blend is you want when you feel sickness arise, especially that yucky sore throat you sometimes get before your cold. Give that sore throat a run for it's money, because Purification, Thieves, and Lemon help with the treatment of sore throats. I wanted to share with you this strong diffuser blend because it is flu season, and if you are an oiler in need of a flu bomb, this is the diffuser blend for you! If you aren't a member yet, but are curious about getting started, just ask. I would love to talk oils with you. Stay healthy everyone. I use 3-4 drops in my diffuser. Young Living essential oils are so versatile that you only need to use very few. If you have any more questions, please ask! I would love to help you get started. So one drop of each? Personally I use 5 drops of each in my diffuser. Love Young Living! Personally I use 4 to 5 drops of each in my diffuser plus put theives and frankincense on my feet. Cold and flu totally wipe me out for days. This really helps. Nice posts! Thanks for sharing!